1866 Robert and Janet move to Spring Lake, MI. 1867 (?) Birth of Zenas Winsor McKay (later known as Winsor Z. McCay). The exact date and place of birth are unknown. McCay’s tombstone in Brooklyn and the 1910 Census say 1869. McCay himself claimed he was born in 1871, but it’s probable he was actually born in 1867 on a visit back to West Zorra. 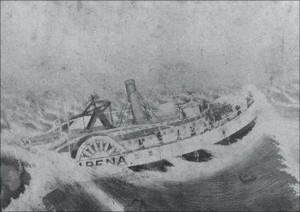 1880 11 year old McCay draws the sinking of the Goodrich Steamship Alpena on the blackboard of the Spring Lake Union School. A picture was taken of the drawing by a professional photographer, and the image was sold on postcards. 1886 At his father’s insistence, McCay enrolls in Cleary’s Business College in Ypsilanti but spends his time in Detroit at vaudeville shows honing his drawing skills. 1888 McCay is taken on as a student by Michigan State Normal School (Eastern Michigan University) Prof. John Goodison, even though he is not enrolled in the school. This is the only formal art instruction McCay ever received. 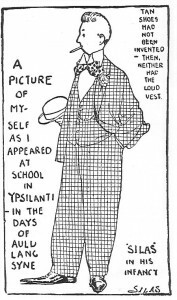 1889 McCay and a friend move to Chicago, where he plans to study at the Art Institute. He does not enroll, but finds employment as an apprentice at the National Printing and Engraving Company. Much of his work is designing and drawing fanciful posters for traveling circuses. 1891 McCay moves to Cincinnati and works for the Vine Street Dime Museum, a “freak show,” where he drew the dog-faced boy, the bearded lady and other attractions. 1891 Maude Leonore Dufour, age 14, visits the Dime Museum and McCay is captivated by her. After a whirlwind courtship, the two elope to Covington, KY and are married by a Justice of the Peace. Mac, as he was then known, begins drawing advertisements for the Cincinnati Commercial Tribune while working for the Dime Museum. 1900 McCay moves to the Cincinnati Enquirer, where he produces his first comic strip, The Tales of the Jungle Imps by Felix Fiddle. The strip ran from January 11-November 9, 1903. 1904 A run of short comic strips in theHerald and Telegram: Mr. Goodenough, Little Sister’s Beau and The Phurious Phinish of Phoolish Philipe’s Phunny Phrolics allow McCay to further explore this new art form. Little Sammy Sneeze, McCay’s new serial strip with a child protagonist, debuts in the Heraldand runs from July 24, 1904-December 9, 1906. September 10, 1904 marks the first appearance the comic strip that would establish McCay as the premiere comic illustrator of his time, Dream of the Rarebit Fiend. He publishes it under the pseudonym, “Silas.” With an interruption during 1911-1913, this strip runs until August 3, 1913, first in the Telegram and then the Herald. 1905 The short run comic, The Story of Hungry Henrietta, debuts in the Herald on January 8, 1905 and runs through July 16 of that year. In the same year, McCay introduces a unique strip, A Pilgrim’s Progress by Mister Bunion, in the Telegram. It is based on the 17th century Christian classic, The Pilgrim’s Progress, by John Bunyan. It will run through December 18, 1910. McCay’s best known and most beloved comic strip, Little Nemo in Slumberland, first appears in the Herald on October 15, 1905 and runs through April 23, 1911. McCay will take Nemo with him when he leaves the Herald, and in all, the young dreamer will continue to have adventures in various papers through December 16, 1926. 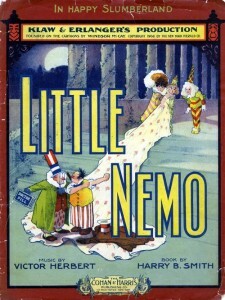 Little Nemo’s lovable characters also inspire McCay’s first attempts at moving animation. 1906 McCay begins doing chalk lightning sketches – a popular attraction performed by artists – on the Vaudeville circuit. A natural performer, McCay’s act is wildly successful. His fame increases as he travels the circuit east of the Mississippi through 1917. 1908 After a one-week preview run in Philadelphia, the lavish musical, Little Nemo, opens October 20 on Broadway. It runs there and in other eastern cities through the winter of 1910. 1911 McCay’s first attempt at animation, Little Nemo, astonishes his Vaudeville audiences, who see beloved characters from the comic strip jump, flip, expand, contract, smoke cigars, roll their eyes and otherwise come to life. With his contract expiring at the Herald, McCay makes the move to William Randolph Hearst’s newspaper empire. 1912 McCay’s second animated film, How a Mosquito Operates, and its slightly anthropomorphic mosquito protagonist charms enthusiastic audiences. 1914 After a two-year wait, audiences are rewarded with the endearing Gertie the Dinosaur. Invested with human characteristics like shyness, a temper and the ability to cry when her feelings were hurt, Gertie becomes an immediate audience favorite. This time period was the heyday of Yellow Journalism, and Hearst’s papers were in a war of ideas, words and images with those of Joseph Pulitzer. The spoils of that war were dollars – millions upon millions of them. During the first three months of the year, McCay entirely ceased drawing comics to concentrate solely on editorial cartoons to accompany the papers’ often inflammatory op-ed pieces. 1918 McCay makes the very first foray into serious subject matter in animation, The Sinking of the Lusitania. The film brings viewers to the site of the tragedy off the West coast of Ireland on May 17, 1915, when the ship, en route from Liverpool to New York, was torpedoed by a German submarine. The somber, serious material and respectful way McCay treats the subject opens up vast horizons of possibility for new directions in animated film. 1918-21 The Centaurs, Flip’s Circus, and Gertie on Tour were short films that were never commercially distributed, but were featured in McCay’s vaudeville act. By this time, his audiences had come to expect that a film short would be part of a McCay performance. 1921 McCay’s final three films, Bug Vaudeville, The Pet and The Flying House, were based on his successful comic strip, Dreams of the Rarebit Fiend. In the films, McCay provides innovative subject matter, characters and techniques that would inspire animators for decades. 1922 McCay makes an arrangement with the B.F. Keith Vaudeville circuit to continue booking performances for him, in New York and other cities east of the Mississippi. His act had sometimes been a source of conflict with William Randolph Hearst in the past, but the two must have come to an agreement when McCay took a forced vacation at Hearst’s ranch in San Simeon, CA in 1920. These performances were a welcome escape from the steady and intense pressure Hearst put on McCay. 1924 McCay leaves the Hearst papers when his contract expires and returns to his former employer, now the New York Herald Tribune. That year, he is invited to revive the Little Nemo in Slumberland comic strip after thirteen years away from drawing strips. 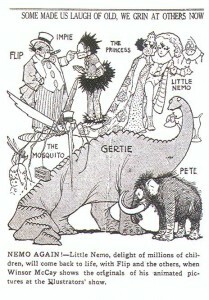 Having escaped the demands of Hearst and his editor, McCay’s imagination and creativity were revitalized with this last run of Nemo, which ended December 26, 1926. 1927 After a few years of wooing by Hearst, McCay returns to draw for him again. McCay claims the move was because of personal admiration for Hearst, but theHerald Tribune’s decision to drop Nemo undoubtedly influenced his decision. McCay returns to drawing editorial cartoons, and the pressure on him from Hearst’s editor is more intense than ever. 1921-34 Though McCay had plans to work on further films, including projects with his son, Robert, William Randolph Hearst refused to allow McCay the time off he requested to focus on animation. 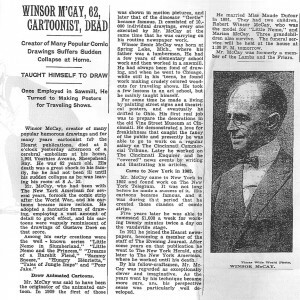 Hearst had relied heavily on McCay to produce biting and pointed editorial and political cartoons for his papers since McCay started working for him. As the years went by, Hearst saw McCay’s work as deteriorating in both artistic acumen and wit, and he often focused his mercurial temper on the artist. 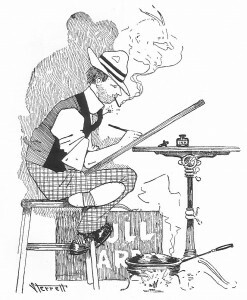 McCay continued to draw for Hearst until his death on July 26, 1934, with his last editorial cartoon being published four days before he passed.